The Asset Essentials and Capital Forecast data sync allows you to export your Location data from Asset Essentials into your Capital Forecast account. After exporting your data into Capital Forecast, your Asset Essentials Locations will become Capital Forecast Bldg./Units and your Asset Essentials Sites will become Capital Forecast Locations. Before using this feature, make sure the AE Client check box is checked in your Capital Forecast Account Settings. *Note: Your Capital Forecast account must be set to model by Bldg./Units to use this feature. We recommend contacting your implementation specialist or consultant if you have questions about this process. In order for your Locations to be imported into Capital Forecast, there are a few settings that need to be configured for each Location in Asset Essentials. Click on the Assets menu icon, then select Locations. Click on the name of the Location. In the General section, check the Building box. This will reveal an additional Building Type field. Select a Building Type that corresponds to this Location. *Note: If you plan on using custom Building Types in Capital Forecast, we recommend you create the custom Building Type within Capital Forecast first, then apply the custom Building Type to the Asset Essentials Location after exporting your data from Asset Essentials. For now, select one of the predefined Building Types from the list. Enter the Location's Square Footage, Occupancy/Room Capacity, and Date Built. *Note: If you only know the year the Location was built, we recommend selecting January first of that year. Click the Print/Report button and select Report. Select CapF Locations Export as the Report Type, and click OK.
Once the report loads, click the Export to icon ( ) and select either XLS or XLSX. Be sure the information found in the spreadsheet is correct. *Note: If you are using custom Building Types and have already created them in Capital Forecast, you can replace the Building Type in the spreadsheet with the name of your custom Building Type. Save the file in a location that is easily found on your computer. Click on the Import Data link under the Information & Analysis section of your Capital Forecast home page. Hover your mouse of the Shortcuts menu and click on Import. Select Locations - Bldg./Units under Import Type. Search for the file that you saved and select it to upload. Make sure the correct Excel Sheet Name is entered. This must match the name of the Excel worksheet in the saved file. On the Submit Import page, make sure the Field name and the Excel Column Names match. Click the Validate button at the bottom of the screen. When your file has been accepted on the Import Validation screen, click the Import Data button to import your Locations and Bldg./Units. The Asset Essentials Locations will become Capital Forecast Bldg./Units and the Asset Essentials Sites will become Capital Forecast Locations. 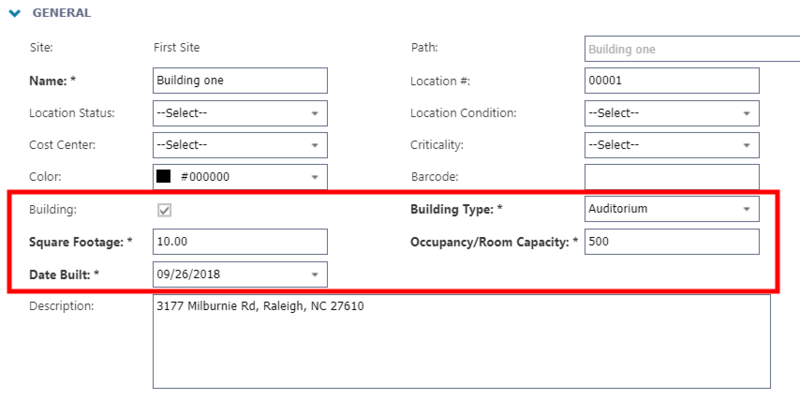 When viewing a Bldg./Unit's details, the Region and Path fields will now be populated with the appropriate data from Asset Essentials. *Note: If your account does not use Regions in Asset Essentials, the Region field will display as "Unspecified" in Capital Forecast.